Click Layout Then page element Now Click Add a gadget Choose HTML/Java Paste below Code in it Click Save ! Now you can see auto scroll news ticker on your page. for example the code for youtube videos, with the youtube videos small thumbnails scrolling and, if possible, explain a way for the youtube videos to play inside the Vertical scroller [like having a halt on hover]? @ Hi Joana Morais Welcome to Plug n Play, Here you are asking that how can we show or embed youtube videos in Ticker, and to play and stop ticker on mouse over. 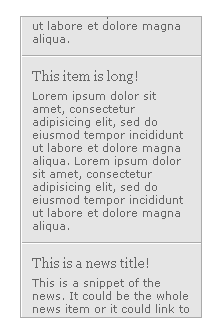 Ok I have created a blog ( http://jquery-for-blogger.blogspot.com/ ) for explaining how to embed different thing like text, Link, Videos etc.. in Ticker given Above. and the code used is also given there.Its not so Hard you can also change Ticker Width and Height given in HTML part. About external Feed a simple widget can do that i will post an article about that.Today.Please wait for a while. Hi Joana You asked.How to put External Feed in Ticker ? I like the widget. It's really useful. But how can I add this on the particular page only? i put this on my blog but it didn;t scoll like you said. Hi, how can I put it only one particular page? Could you please update your Bloggerplugnplay_scroltickertxt.txt file??? Hello! Could you please update / reupload your "Bloggerplugnplay_scroltickertxt.txt" file?? ?